Good putting leads to greater enjoyment. We can all play badly and still have fun if the company is good, but deep down we would like to do better without too much hard work. This web site sets out to describe in a concise and logical manner the step-by-step fundamentals of getting your ball in the hole in the least number of shots. In my day-to-day reading, research, and watching televised golf for a greater in-depth analysis of how the professional golfers go about their business, I am always on the lookout for better ways of expressing the information. This includes reworking and updating existing content, adding more pictures, diagrams and contrasting opinions that can help to build understanding. If you are looking for some specific information, just click on Putting SiteSearch in the right hand column and enter the relevant word or phrase. 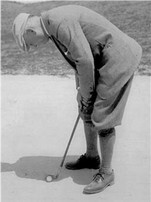 For example, Putting Stance. Understanding is a precursor of performing an action more adeptly. We all learn from hands-on experience, but understanding what you are trying to achieve speeds things along. The fundamentals of success with the flat stick are more or less carved in stone. Most changes are cosmetic rather than a radical departure from what is already known. Golf has a long history of trial and error. The principle that for your ball to set off straight requires your putterface at the precise moment of contact to be 90 degrees to your aimline is as true today as a century ago. I hope that you find the web site both instructive and informative. If you have a idea for a topic, I would welcome your suggestion.